A good place to start - Toothbrushes. So many brands, shapes and sizes. Types of bristle. Biodegradable? And then the big one – manual or electric??! It can all be a bit confusing. First of all, lets get back to basics, what is the purpose of a toothbrush? To clean away all the nasty plaque bacteria that accumulates on the teeth and gums. If plaque is not removed then it can cause bleeding and receding gums (gum disease), and decay (cavities). Brushing twice a day in the morning and just before bed is imperative regardless of the implement you use! Spending two minutes and focusing brushing in soft circles along the gum line (also scrubbing the biting surfaces!) in a routine manner helps to prevent plaque accumulation and over brushing. Although there are now many different choices of toothbrush, toothbrush design has had little innovation and forward movement over the years, since the shift to electric brushes. It is important to remember that how effective a brush is at removing plaque should be the key factor in your choice. In fact, it is more important than that the toothpaste you choose. Without a small, ergonomic design that is comfortable to hold and use then proper teeth cleaning cannot be achieved. So let’s check out some of the more ‘exciting’ toothbrushes! First up here’s one of the most innovative brushes out there at the moment. It comes all the way from the USA by a company called Boie and it boasts an environmentally friendly and long-lasting brush head, which is BPA free and recyclable!The toothbrush bristles are made out of silicone and are embedded with silver which helps to produce an antibacterial affect to protect from harmful oral microbes. These toothbrushes are an interesting concept providing non-porous bristles, which carry less bacteria. Sounds great right? Well there is a couple catches. The effectiveness of the silicone bristles on removing plaque have not yet been studied and, although may be successful, it is difficult to recommend silicone brushes yet, due to the lack of evidence. Also, the brush heads are quite large making it difficult to get into all the nooks and crannies of the oral environment. Predominantly made from mao bamboo which grows sustainably, quickly and is only used for commercial use leaving plenty for the pandas to eat! The bamboo toothbrush handles are completely biodegradable and you are encouraged to throw them into your compost to decompose. Unfortunately, the bristles are a different story. Most are made from types of nylon which are not biodegradable. Manufacturers of nylon-4 will claim that lab studies have shown them to biodegrade in the environment under certain conditions. However, a laboratory and the cold Bass Strait are a completely different story! At The Northside Dentist we stock Got Wood? bamboo toothbrushes which not only helps to cut down the plastic brushes one by one but also sponsors World Vision and other charities. They are available to buy for $4 at reception. 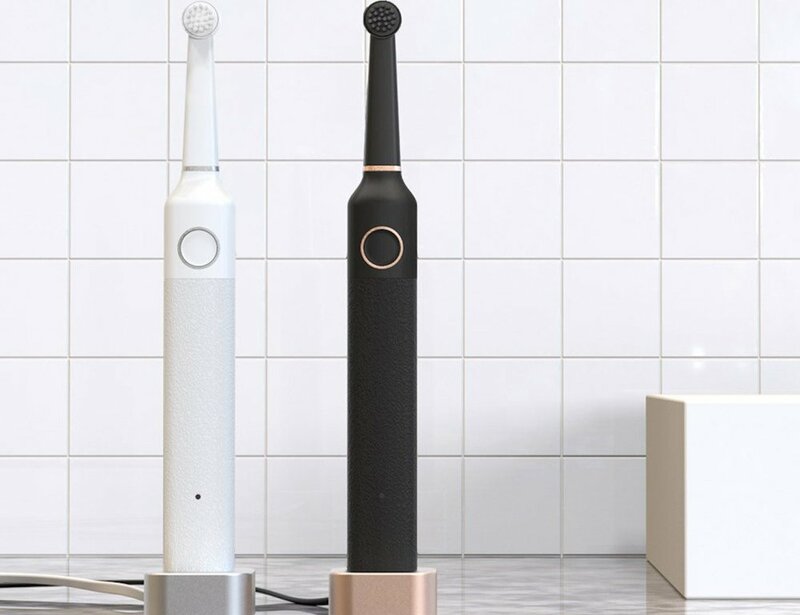 Finally if you are looking for a beautiful, minimalist design with both Italian and Swedish influences then don’t look past the Bruzzoni electric toothbrush. Available in either white with silver metal trim or matte black with rose gold trim, this brush will look good in any situation and bring an element of design to your bathroom. The high speed oscillating brush head with soft bristles uses a 2 minute timer to ensure a clean, fresh mouth while helping to eliminate trauma to your gums. In comparison to some electric toothbrushes, Bruzzoni's brush head is slightly larger which can make it a little harder to get into those back areas for optimal cleaning. Although I’m sure the brush can be forgiven considering its beauty! The Bruzzoni toothbrush is available at The Northside Dentist for $219. At the end of the day, when picking your toothbrush it comes down to whatever you are comfortable using and works best for your mouth. So remember, get a toothbrush you like, brush two times a day and visit The Northside Dentist every 6 months!